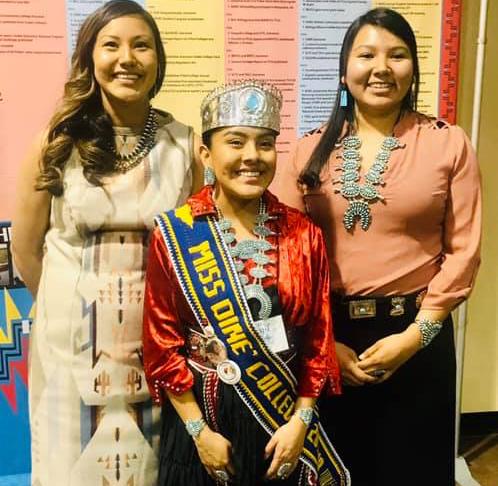 Diné College’s Audre Etsitty (l), Mariah Lee (m) and Korrie Brown (r) recently attended the American Indian Higher Education Consortium (AIHEC) conference where the school won numerous awards. Billings, Mont. — Diné College’s top organizers of the 2019 American Indian Higher Education Consortium (AIHEC) agree on one main thing: The annual event is a magnificent opportunity for students to grow and learn intellectually. Students participated in everything from meetings to academic contests to networking opportunities with administrators from fellow tribal colleges and universities. Diné College had two teams come away with first place honors and another four finish in second place at the recent event. There were 38 tribal colleges and universities that participated in academic and athletic competitions. “We selected outstanding coaches and student participants from main campus and the other centers,” Reeverson Descheny, director of career advancement at Diné College, said. Descheny attended the event last year as a co-organizer, too. Descheny, an Arizona State University graduate, said there were 29 student participants along with 9 coaches this year, compared with 20 students and 15 coaches and staffers in 2018. He noted that six of this year’s 29 were prior AIHEC participants. Patrick Blackwater, a business administration and marketing instructor at Diné College, was this year’s other co-organizer. Blackwater, a Diné College grad, agreed that students do learn and grow from the AIHEC experience. That was echoed by the reigning Miss Diné College, Mariah Lee. Lee called AIHEC a great experience. 1st Place: Webpage Design: Anthony Hale, Ryan Lee (Individual Entries). Coach: Malcolm Bob. 1st Place: Science Traditional Plants/Herbs: Korrie Brown. Coach Audre Etsitty. 2nd Place: Critical Inquiry: Charlene Bahe, Miranda Smith, Delia Wauneka, Mariah Lee. Coach: Dawayne Bahe. 2nd Place: Science Poster: Tyler Begay. Coach: Audre Etsitty. 2nd Place: Photography: Ritchie Kaibetony. 2nd Place: Jewelry: Troy Uentillie. Established in 1972, AIHEC represents the interests of tribal colleges and universities. In 1989, AIHEC created the American Indian College Fund to raise scholarship funds for qualified American Indian students.